Liu was born in 1967 in Shashi city, Hubei province. He was graduated from the Hubei Art Academy in 1993 and specialized in oil painting. Liu made his debut in 1985 at the Hubei Young Artists Festival Exhibition being held in Wuhan city, the provincial capital of Hubei province In 1992, he was invited to participate in the 1st Guangzhou Art 90s Exhibition being held at the Guangdong Art Museum. 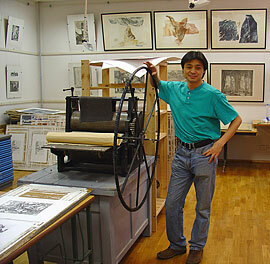 Liu had his first solo exhibition held at the Hubei Art Museum in 2009. It was in 2006, Liu spent a year to study and research on oil painting at the Moscow Surikov Art Institute. Currently, Liu is lecturing art at the Hubei Art Academy.